The recent RICS housing market survey indicated no noticeable impact on the housing market following recent stamp duty changes announced in the Budget, which is not surprising. Market sentiment from surveyors reflected a geographic divide with caution about London and the South East price momentum coupled with what they described as a “supply crisis” with a dearth of new instructions evidenced by 22 consecutive months of decline. Conversely UK Finance forecast £262 billion of advances in 2018, reforecast up from £252 billion, and £271 billion in 2019. Buy-to-let activity will remain resilient at constant levels over the next three years, which is a solid recovery. UK Finance’s belief is that first-time buyers will underpin the next few years especially as they have outperformed expectations in 2017. 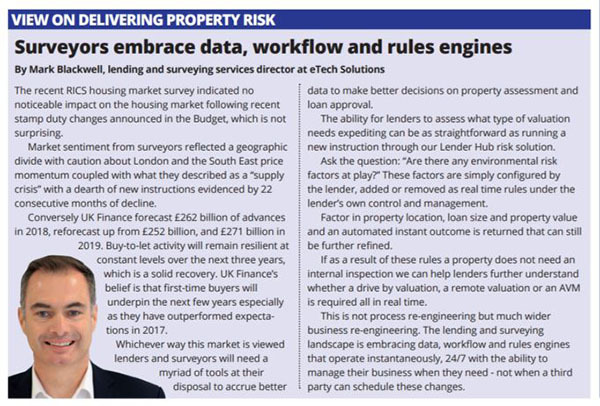 Whichever way this market is viewed lenders and surveyors will need a myriad of tools at their disposal to accrue better data to make better decisions on property assessment and loan approval. The ability for lenders to assess what type of valuation needs expediting can be as straightforward as running a new instruction through our Lender Hub risk solution. Ask the question: “Are there any environmental risk factors at play?” These factors are simply configured by the lender, added or removed as real time rules under the lender’s own control and management. Factor in property location, loan size and property value and an automated instant outcome is returned that can still be further refined. If as a result of these rules a property does not need an internal inspection we can help lenders further understand whether a drive by valuation, a remote valuation or an AVM is required all in real time.